Home / All FAQ / What causes a Graphic Not Found error? And how do I fix it? Cubase and Nuendo give us no way to get the Track Name. There is no key command or no other known way to get (or edit) the name of your current track (and various other things). MEAP has to look for the Solo Button on your screen. When it finds the Red [S] It then moves the mouse and double clicks to the right of that button to select the Track Name. MEAP will then copy the result to the clipboard so it can be used later. This method is rather clever but it does rely on the fact that it knows what your active Solo Button looks like and it relies on the fact that the Solo Button actually gets pressed. Sometimes MEAP cannot send key commands because it does not have administrative permission. You will have to make sure you are running MEAP as an Administrator. 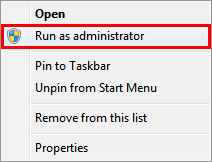 On some Windows systems you will have to make sure you are running MEAP as an Administrator. An ordinary process (a process run as a standard user) can not interact with or exchange information with an admin process. 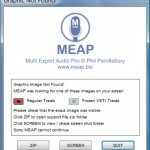 So if your audio application is running with elevated privileges, MEAP cannot interact with it. In Cubase 5 and 6 – this also applies to the Export Button and the Path area in the Export Audio Dailog. And in a number of other areas too. For example, you may see that the “path” cannot be found. This is because MEAP needs to find the text “path” on your screen and match it to a previously captured image of that text. So to recap: MEAP needs to be able to see the buttons or folder icons clearly. If you have your track height too small, for example so that the buttons (or folder icons) are cut off, then MEAP will fail. Previous post: MEAP doesn’t seem to do much when I run it! Next post: How do I find out about new MEAP releases and news?